Highlighted in e-consultancy.com, Australia should not be neglected by domestic and/or foreign digital marketers. With the growing strength of the Australian dollar and economy and a high online adoption by consumers, Australia’s digital industry is struggling to keep up. It is indicative that now is the time to capitalise on the untapped demand of the digital consumer. Unfortunately companies are still failing to acknowledge this demand or failing to execute successful digital marketing strategies. The rise of the Australian digital economy has been driven by easily accessible technology and government initiatives such as the National Broadband Network (NBN). 1. The need for internal marketers to adopt a rapid “do-or-die” approach to the marketplace to take advantage of online adoption among consumers. 2. The opening for external marketers to take advantage of a relatively insular marketplace, where hisorical barriers of entry are being lowered by associated technologies. Applicable to my initial point, with the absence of national marketers taking advantage of online adoption among consumers, this has lead them to turn to international sites. In turn this has lead to international companies identifying the gaps in the market, moving in and looking to secure their place. This can be seen in the case of Macy using eBay as a domestic platform to sell to the Australian online consumer as a result of the high Australian dollar. 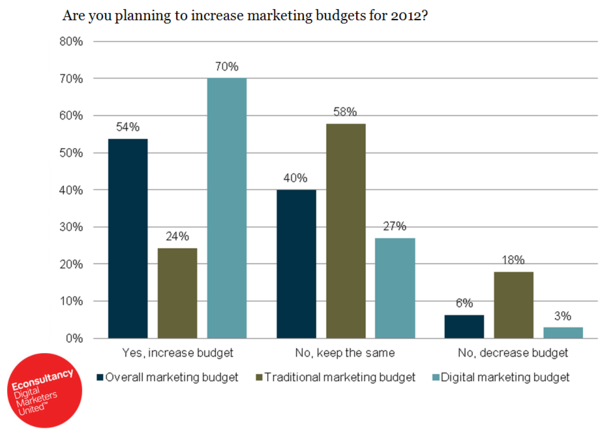 However the e-consultancy article did highlight an intention by client side marketers to increase their digital marketing budget over the coming year versus traditional offline budgets. I believe the next phase of a digital budget increase is whether it translates to effective and pertinent digital marketing strategy. Time will tell.